Mohsen was arrested on April 29th, 2009, after a State Security force broke into his house in Fayoum govern-ate (North) and searched it. As Mohsen was already moved to Upper Egypt, a police officer summoned him to the prosecution office in Fayoum. 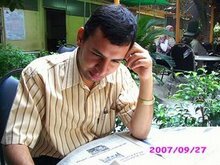 The detained blogger started his online activities in 2006, with the blog Fattah Einek (Open your eyes) where he used to write about human rights situation in Egypt and in his small governorate of Fayoum, and writes poems about freedom and the Israeli-Palestinian conflict. He also blogged about his experience when arrested on May 2006 because of his online writings about torture. He is among the first Egyptian bloggers to expose torture practiced by the Interior Ministry in the governorate of Fayoum. The Arabic Blogger union published a memo in solidarity with Mohsen, more than 225 bloggers and journalists signed it so far, the union is targeting 1000 signatures. FACT would love to sign the memo supporting Mohsen but the linked page is in Arabic and Google Translate won’t translate it. Will someone please let us know how to sign?